July 1839 Magazine Editor Poe is hired as an editor at Burton's Gentleman's Magazine, a job he holds until June 1840. 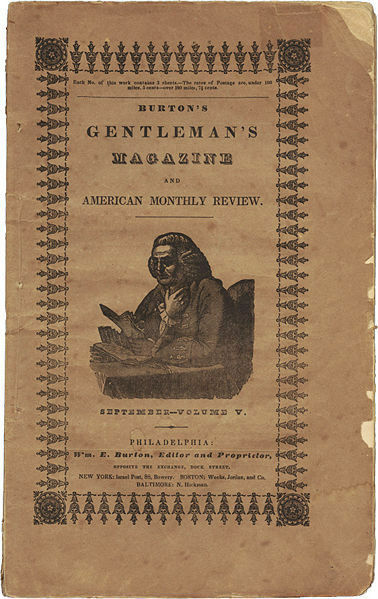 In the summer of 1839, Poe became assistant editor of Burton's Gentleman's Magazine. He published numerous articles, stories, and reviews, enhancing his reputation as a trenchant critic that he had established at the Southern Literary Messenger. Also in 1839, the collection Tales of the Grotesque and Arabesque was published in two volumes, though he made little money off of it and it received mixed reviews. Poe left Burton's after about a year and found a position as assistant at Graham's Magazine. Burton's Gentleman's Magazine or, more simply, Burton's Magazine, was a literary publication founded in Philadelphia, Pennsylvania in 1837. Its founder was William Evans Burton, an English-born immigrant to the United States who also managed a theatre and was a minor actor. The magazine's most famous contributor and one-time editor was Edgar Allan Poe in 1839. The June 1839 issue of Burton's included the notice that its owner had "made arrangements with Edgar A. Poe, Esq., late Editor of the Southern Literary Messenger, to devote his abilities and experience to a portion of the Editorial duties of the Gentlemen's Magazine." Poe agreed to provide about 11 pages of original material per month and was paid $10 a week and his name was added next to Burton's. In Burton's, Poe published now well-known tales including "The Man That Was Used Up," "The Fall of the House of Usher," "William Wilson," "Morella" and others. In 1841, Burton sold the magazine to George Rex Graham. It was then merged with Atkinson's Casket to become Graham's Magazine.